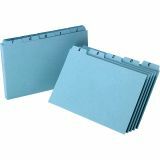 Oxford A-Z Tabs Index Card Guides - Card guides are labeled A to Z (including Mc and XYZ) on 1/5-cut tabs for easy alphabetizing. Letters are printed in black ink. Heavyweight 25 point stock delivers superior rigidity and strength.